I love an alliterative title and very nearly added “bags” as in undereye bags, to the broderie and butterflies. The last two weeks have been particularly hectic and the lack of sleep brought about by seemingly endless hurdles really does show. My parents and brothers, (and my pregnant sister-in-law), have been a continuous source of practical support and we have just about tamed the garden and adjoining field (three acres) and tackled the overgrown hedges to encourage the sale of the house. It’s been a huge task and one which I could not have managed alone. Ironically, this dream, forever home, which now holds such sadness, has never looked more beautiful. But, amongst the anxiety and uncertainty, have been so many brilliant nights out and nights in with friends and family. Birthdays, celebrations of football trophies, of excellent school reports and of amazing SATS results. I’ve had a lot of fizz. And eaten a lot of cake. Last week my children, my niece and nephew whizzed around the field until sunset on the ride-on mower. Their faces showed pure unadulterated joy. Fun. Laughter. Happy memories for all of us to take away from here and into the future. This morning, I met with a new friend. I’m taking over the communications, website and social media of our respective sons’ football club. I volunteered for this role because he is moving from the area with his family. He has shown infinite patience and kindness but I’m a bit daunted about filling his rather large shoes. This was our third meeting and I think I now, just about, know what to do. So my blog has had to take a back seat these last few weeks. Today’s is a very simple outfit. The tee was from Fat Face earlier in the season. For me, the neckline has just the right scoop. And of course, my love of broderie is no secret. The cropped jeans are from White Stuff four or five years ago but their Southern Ocean Crops are this year’s version. I added some colour with the beautiful butterfly scarf (from my boutique) and my Boden bowling bag. 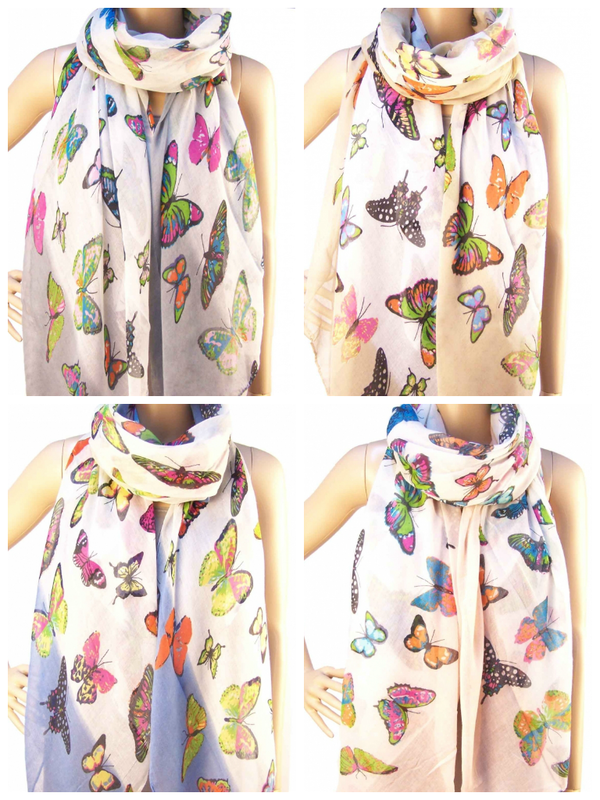 This scarf is available edged in blue, grey, pink or khaki. The butterflies are happy and bright and work with so many colours. There are so many more beautiful designs in the boutique, do take a look. They’re large enough to use as a sarong, so some will be definitely making their way into my suitcase later this month. Sounds like you've had a hard few weeks both physically and emotionally – sounds like you all deserve a holiday. That top is very pretty – I'm loving all the broderie around at the moment – I have a lovely white sleeveless vest from Next and I just got a navy capped top from Boden with a panel down the front.